Where do I start. Easy parking, friendly staff, close to shops and ferry terminal. The most comfortable bed I've ever slept in. Good shower pressure. Huge, clean, kitchen with everything you need. I loved how I could feed the birds from the windows! Love the pool. Will definitely stay again. Thank you! The view of Sydney Harbour (opera house, bridge, sailboats, etc) was spectacular. Perfect location - the close proximity to the ferry stop and the bus stop made everything around the Harbour more accessible. The hotel pool was also a bonus, especially with the hot weather. It was the perfect location to explore Sydney! The kids loved going on the ferry. The views I got from just outside the building on the boat dock. The room was well laid out with plenty of light. Although there was no air con, there were ceiling fans and a sea breeze. Value for money was excellent. Free parking is the icing on the cake. Perfect location. Just metres away from the ferry terminal. Loved stepping out of the front entrance and seeing the view; just like a postcard! what a location. clean/ bright/ comfortable and all you need for a self contained stay...including a friendly couple of eastern rosella that visited every morning!! 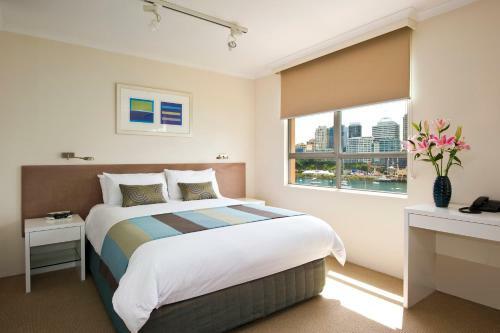 Lock in a great price for Harbourside Apartments – rated 8.6 by recent guests! Harbourside Apartments This rating is a reflection of how the property compares to the industry standard when it comes to price, facilities and services available. It's based on a self-evaluation by the property. Use this rating to help choose your stay! 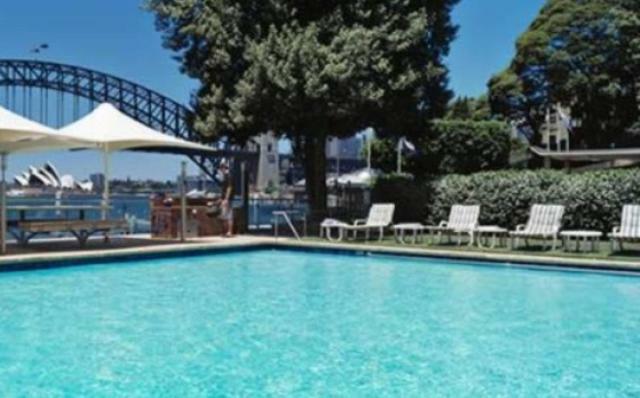 One of our top picks in Sydney.Located on Sydney Harbor’s edge, next to McMahon’s Point Ferry Wharf Harborside Apartments offers a swimming pool and a private jetty. 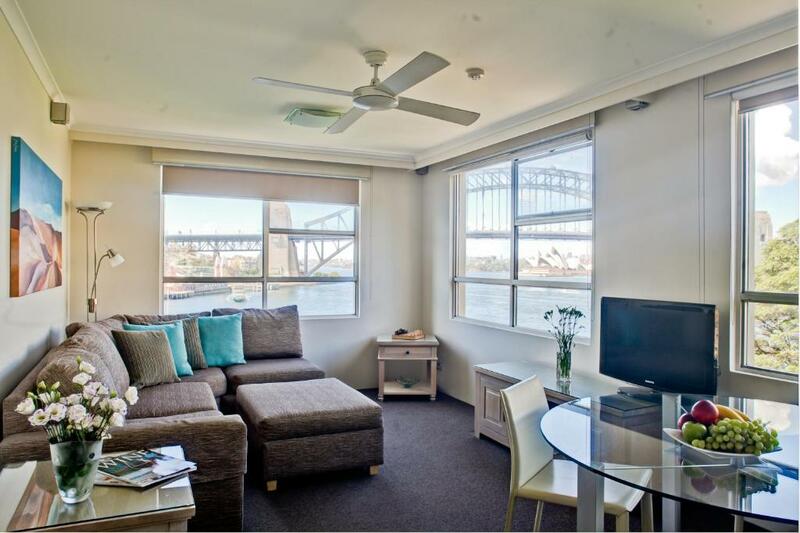 Some apartments offer views of Sydney Harbor Bridge, Sydney Opera House, Sydney city or North Sydney. All Harborside Apartments have fully equipped kitchen facilities, a lounge and dining area and private bathroom with a hairdryer and bathrobes. 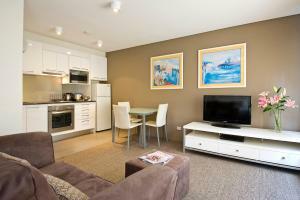 Each apartment has an LCD TV with cable channels and a DVD/CD player. 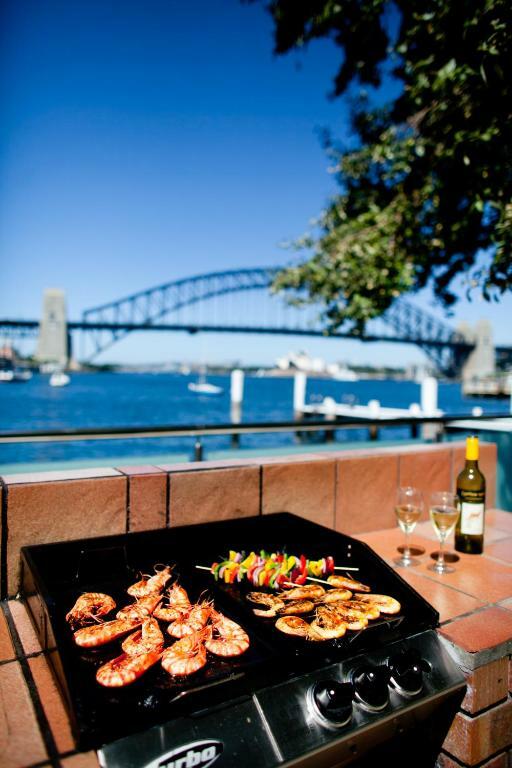 Sails on Lavender Bay Restaurant is located on the property and offers seafood and modern Australian cuisine. 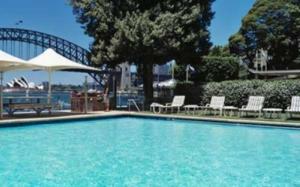 The Sydney Harbor ferry service stops just next to the property, it is a 7-minute ferry ride to Darling Harbor. Sydney International Airport is 14 mi away. Sydney Taronga Zoo and Sydney’s city center are both 15 minutes’ drive away. 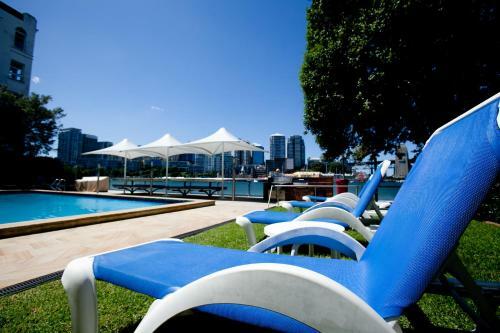 McMahons Point is a great choice for travelers interested in scenery, convenient public transportation and restaurants. When would you like to stay at Harbourside Apartments? 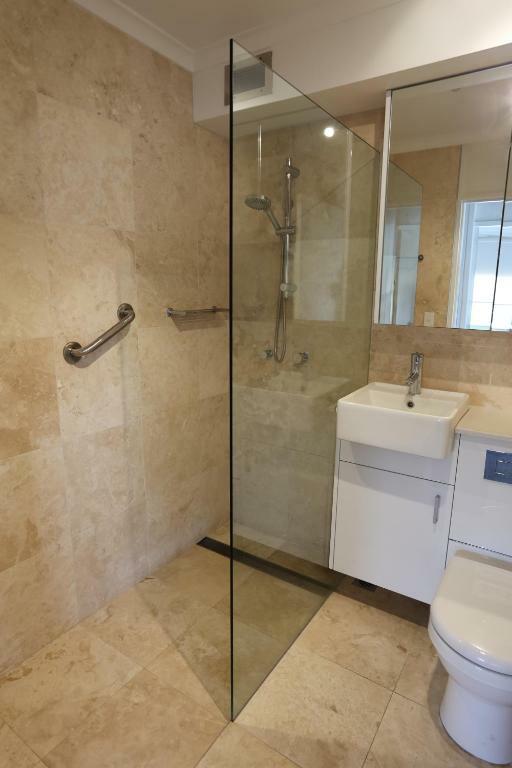 This apartment has a fully equipped, open-plan kitchen and a bathroom with bathrobes provided. 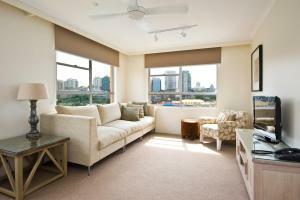 This apartment overlooks Lavender Bay and features a separate lounge/dining room and a fully equipped kitchen. Includes a bathroom with a bathtub and a shower. An additional person will be charged $30 per night for use of sofa bed. 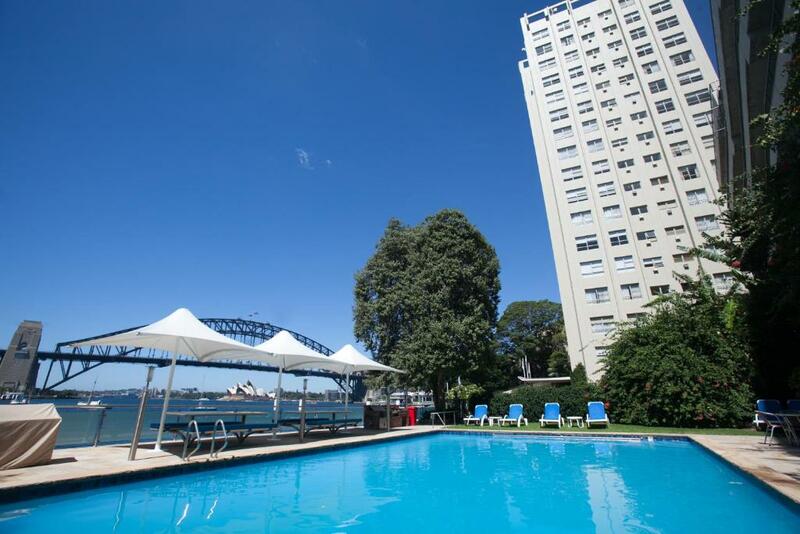 This studio has views of Sydney Harbour and features a fully equipped, open-plan kitchen and a bathroom with bathrobes. This apartment offers views of Sydney Harbor and features a lounge/dining room, fully equipped kitchen and a bathroom with a bathtub and a shower. This apartment offers a lounge/dining room, a fully equipped kitchen and partial Harbor views from the lounge room and bedrooms. Includes a bathroom with a bathtub and a shower. At Harbourside we look to your every need in providing quality linen and tableware, luxury toiletries and fluffy white towels. Kitchens all feature a full sized refrigerator, stove, microwave and all the utensils, pots and pans required to prepare a gourmet meal. The waterfront swimming pool and barbecue area is an idyllic spot for relaxing while absorbing the romance of the harbour activities. 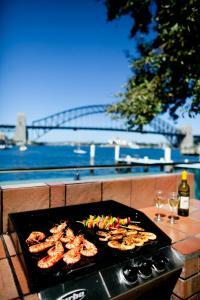 It also provides a delightful alternative for alfresco dining. Area Info – This neighborhood is a great choice for travelers interested in scenery, convenient public transportation and restaurants – Check location Excellent location – show map Guests loved walking around the neighborhood! House Rules Harbourside Apartments takes special requests – add in the next step! Harbourside Apartments accepts these cards and reserves the right to temporarily hold an amount prior to arrival. Please be aware there is some construction occurring in the area which may impact your stay. For further information please contact the property, using the contact details found on the booking confirmation. Please inform Harbourside Apartments of your expected arrival time in advance. You can use the Special Requests box when booking, or contact the property directly using the contact details in your confirmation. The room was very old, outdated and need of modern decor.... The kitchen was really bad, furniture smelt and the bathroom was old. The bathroom is my only criticism - the shower pressure is rubbish & goes hot then cold. We were upgraded to a harbour view room It was amazing, like the bridge was hanging in your living room. Can't think of anything I didn't like! When I checked in, the staff member did not give me back my license. I was not informed until I checked out the next day. I thought this was appalling. Easy to book and available in short notice. Very hot weather but no ceiling fan or aircon. Barely able to open windows. In a word - oppressive. Premium location. Close to ferry. Relatively quiet. They didn't wash up..........perhaps that's not in the deal? Old building, no AC in the facility which is odd for the paid price. Old aluminium windows. Old slow elevator. The whole building needs a proper renovation. No air conditioning. Rooms feel stuffy. Windows only open a small amount so you can’t catch the breeze. The blanket on top of the bed was so old and needs replacing. Very warm in the afternoon. 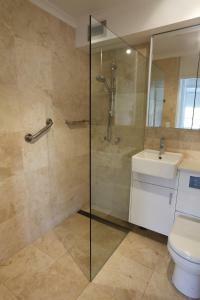 Beautiful refurbed bathroom. Spectacular view. Great cafes a short walk away. Pool area was wonderful. Amazing view with the ferry very close by.